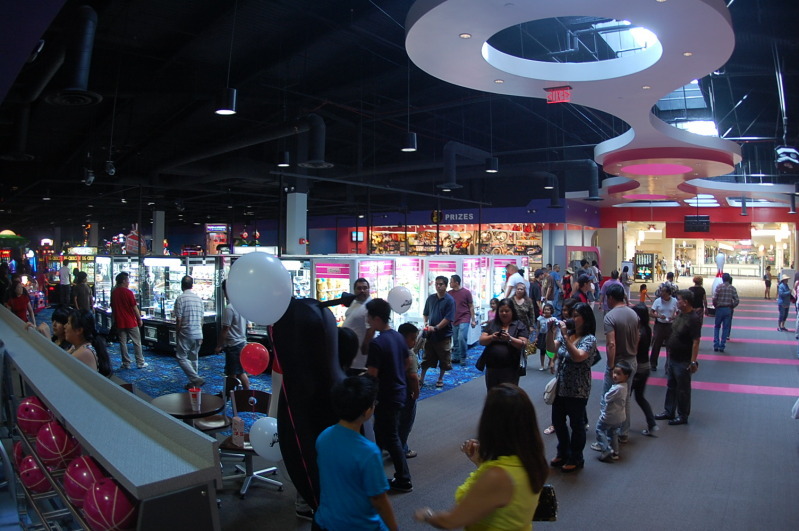 A new amusement facility has opened up at the Puente Hills Shopping mall in the LA area and thanks to AH contributor Phil Arrington (who setup the Arcade Heroes videocast at Amusement Expo earlier this year and also gave us a glimpse at an auction not too long ago) we have an in-depth look at this awesome new location. Called Round 1, this is the first amusement facilities that the company has setup in the United States, with most of their locations being found in Japan. The arcade might not be the primary focus of the facility which also sports a modern bowling alley, pool tables, darts, karaoke, ping pong and food but the game selection is nothing short of impressive. Some of the titles found at Round 1: Terminator Salvation Super Deluxe (the 100″ version); a four-player Tank! Tank! Tank! ; a Deadstorm Pirates; two Sega Rally 3 motion deluxe machines; four Initial D5 units; four GTI Club units; four Wangan Maximum Tune 3DX+ units; linked Street Fighter IV; two Tekken 6 cabs; Samurai Shodown Sen; a GuitarFreaks and DrumMania XG; Pump It Up Pro 2; Raiden IV and more. I hadn’t heard of GTI Club making it to the States until now and the selection shows that they are aiming to bring together some of the best titles from around the world. I would not be surprised if they will have a Darius Burst AC there when that is available, but we’ll have to wait and see.The only thing Round 1 seems to missing are some pinball machines. Phil took a bunch of pictures of the new location, hit the link below to start the tour. We have covered a couple of Brazilian made arcade video games in the past, notably Senninha GP and GP Brasil, both racing titles. I also got a look at several arcades when I made a trip down there earlier this year. This new game however fits more in-line with Brazil’s national passion – futebol (aka soccer). Called RoboGol, it’s a robotic amusement game where four players participate in robotic soccer, controlled by joysticks and buttons. It’s fairly similar to MaruBot Football (which we saw at IAAPA and Amusement Expo) but it uses different controls and the robots themselves are of a unique design. It does come down to control with these kinds of games – from what I played of MaruBot it required a few attempts to get used to how the robots would react. From what I read, it appears that the company behind Robogol is trying to distribute the game into other territories in South America but I can’t find a price on the unit. Here’s a trailer for RoboGol. The second video is from the popular TV program Globo Esporte where they explain the game a little better – it’s a three button configuration and one button kicks, the other two spin the robot quickly in either a clockwise or counter-clockwise direction. The one thing missing from the game is an announcer yelling “GOOOOOOOOOOOLLL!” when a goal is made but I guess they decided to leave that up to the players. You can find out more by visiting Xbot (creators of the game) or the RoboGol website.